Is swimming pool maintenance a chore? Does your pool go green? Floatron uses solar power to keep your swimming pool crystal clear and and healthy the stress free way! no smell, no taste, no more red eyes, less damage to the environment and if that isn’t enough to tempt you it is less work!! floatron costs nothing to power, operate or fit. It is unobtrusive and portable – only the size of a frisbee. Floatron works well with most pool covers. Floatron for swimming pools is the only solar powered water purifier on the market. Floatron doesn’t require costly, complicated fitting and that works well with a pool cover. 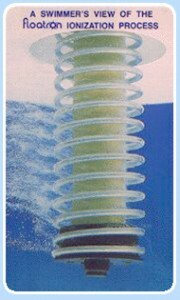 Fitting the floatron in your swimming pool couldn’t be easier, simply tether near a point of good circulation i.e. water inlet, then the floatron will start ionising you pool straight away. In a pool of approximately 15,000 gallons (68 cubic metres), it takes approximately three weeks to reach the optimum ion level of 0.3ppm (an ion test kit is included with the floatron). Once the pool is ionised, chemicals can be gradually reduced as per the instructions. The instructions are very comprehensive and although the floatron is really easy to use, we recommend reading and re reading them, as the majority of after sales enquiries are answered in the instructions. Some contaminants in your pool such as dust, suntan lotion, body fluids, etc. are not affected by minerals. An accumulation of these will tend to cloud the water, therefore a small amount of chlorine or any other oxidizer, is necessary to dissolve them to maintain crystal clear conditions. A 75% REDUCTION IN CHLORINE REQUIREMENT IS TYPICAL. We use the large (the size of a shoe polish tin) slow release chlorine tablets in the filter basket. Other agents may be substituted such as bromine, hydrogen peroxide or oxygen based compounds, which are readily available from most pool stores. Floatron is also compatible with salt water systems. If you have a sand filter we do recommend changing the sand before using the floatron, as some shock treatments and flocculents can have a detrimental effect on pool filter sand causing the filter to remove the minerals produced by floatron, this is easily detected by mineral testing the backwash water.